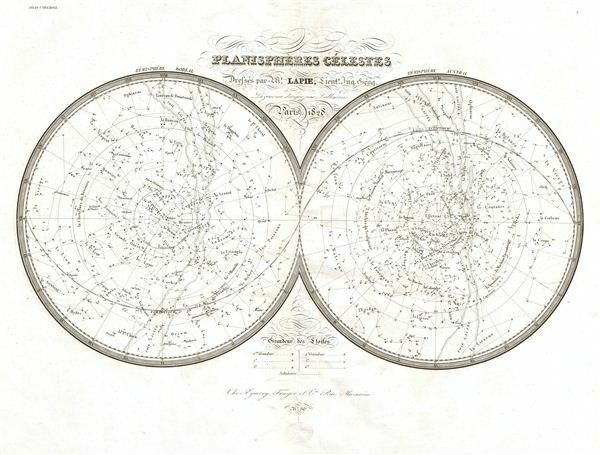 A fine first edition example of M. Lapie's 1828 chart or map of the stars and constellations. This beautifully engraved map consists of two hemispheres detailing the starts of the Northern (left) and Southern (right) Hemispheres. Constellations are rendered by dotted lines connecting the stars. The elliptical passes through both hemispheres. A stunning map, this example offers typical French decorative elements including elaborate typesetting in the central title area. engraved by Armand Joseph Lallemand as plate no. 2 in the first edition of M. Lapie's important Atlas Universel. This chart, like all plates from the Atlas Universel features an embossed stamp from the Lapie firm.